The garage door opener can be trained to operate garage doors, gates, entry doors, door locks, home lighting systems, security systems, and other devices. The garage door opener (HomeLink® Universal Transceiver) is manufactured under license from HomeLink®. 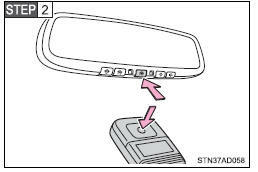 The HomeLink® compatible transceiver in your vehicle has 3 buttons which can be trained to operate 3 different devices. Refer to the training method below appropriate for the device. Keep the indicator on the HomeLink® in view while training. Press and hold down one of the buttons on the HomeLink® and the button on the transmitter. When the indicator on the HomeLink® changes from a slow to a rapid flash, you can release both buttons. If the HomeLink® indicator comes on but does not flash, or flashes rapidly for 2 seconds and remains lit, the HomeLink® button is already trained. Use the other buttons or follow the “Retraining a HomeLink® button” instructions. Test the operation of the HomeLink® by pressing the newly trained button. If training a garage door opener, check to see if the garage door opens and closes. If the garage door does not operate, see if your garage transmitter is of the Rolling Code type. Press and hold the trained HomeLink® button. The garage door has the rolling code feature if the indicator (on the HomeLink®) flashes rapidly for 2 seconds and then remains lit. If your transmitter is the Rolling Code type, proceed to the heading “Training a rolling code system”. Repeat the steps above to train another device for each of the remaining HomeLink® buttons. If your device is Rolling Code equipped, follow the steps under the heading “Training the HomeLink®” before proceeding with the steps listed below. Locate the learn button on the ceiling mounted garage door opener motor. The exact location and color of the button may vary by brand of garage door opener. Refer to the operation manual supplied with the garage door opener for the location of the learning button. Press and hold the vehicle’s trained HomeLink® button for 2 seconds and release it. Repeat this step once again. The garage door may open. If the garage door opens, the training process is complete. If the door does not open, press and release the button a third time. This third press and release will complete the training process by opening the garage door. The ceiling mounted garage door opener motor should now recognize the HomeLink® transceiver and operate the garage door. Repeat the steps above to train another rolling code system for any of the remaining HomeLink® buttons. Keep the HomeLink® indicator light in view while training. Press and hold the selected HomeLink® button. Repeatedly press and release (cycle) one of the buttons on the remote control transmitter for 2 seconds at a time until is completed. When the HomeLink® indicator light starts to flash rapidly, release the buttons on the HomeLink®. Repeat the steps above to train another device for any of the remaining HomeLink® buttons. To train other devices such as home security systems, home door locks and lighting, contact your Toyota dealer for assistance. The individual HomeLink® buttons cannot be erased but can be retrained. To retrain a button, follow the “Retraining a HomeLink® button” instructions. Press the appropriate HomeLink® button. The HomeLink® indicator light should come on. The HomeLink® compatible transceiver in your vehicle continues to send a signal for up to 20 seconds as long as the button is pressed. Press and hold the desired HomeLink® button. After 20 seconds, the HomeLink® indicator light will start flashing slowly. Keep pressing the HomeLink® button and then follow the “Training the HomeLink® (for U.S. owners)” instructions. Press and hold down the 2 outside buttons for 10 seconds until the indicator flashes. ●Install a new battery in the remote control transmitter. ●The battery side of the remote control transmitter must be pointed away from the HomeLink® button. NOTE: This device complies with part 15 of the FCC Rules. NOTE: This device complies with Industry Canada licence-exempt RSS standard( s). Operation is subject to the following two conditions: (1) this device may not cause interference, and (2) this device must accept any interference, including interference that may cause undesired operation of the device.